Roland Petersen is one of the seminal figures of the Bay Area Figurative movement that flourished during the 1950's and 60's. Originally born in Denmark, Peterson studied with Hans Hofmann in Provincetown and received his BA and MA degrees from UC Berkeley. 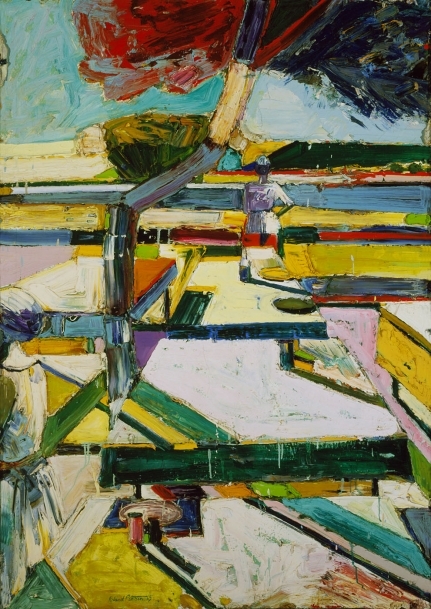 Prior to 1970, when oil paint allergies dictated Petersen’s change to acrylics, he merged pure abstraction and formal analyses of color and space with figural and landscape elements. This stylistic progression reflects the artist’s interest in post-Impressionist geometry as practiced by Paul Cézanne and Georges Seurat. Petersen’s extraordinarily sophisticated palette, a striking combination of light and dark hues, is informed not only by the color theories of Seurat and Hofmann, but also the emotional expressionism of Vincent Van Gogh and the French symbolists. Petersen’s paintings are an example of how abstract expressionism from both the east and west coasts informed his mature style. An active figure in the Bay Area art scene for over fifty years, Petersen was one of the first professors in the nascent art department at the University of California at Davis, where he stewarded the program for more than thirty years, and recruited artists such as Wayne Thiebaud, Manuel Neri and Robert Arneson to the faculty. Petersen has been actively collected by most major museums, including the New York MOMA, the SFMOMA, and the Whitney Museum of American Art.